American Dream U, which helps military members and their spouses successfully transition into new careers or entrepreneurship, is pleased to announce that it is working with Samuel Adams on the “Pour One Forward” program. American Dream U, which helps military members and their spouses successfully transition into new careers or entrepreneurship, is pleased to announce that it is working with Samuel Adams on the “Pour One Forward” program. Through the program, Samuel Adams will contribute funds to support American Dream U’s mission to provide men and women in the armed forces with the resources they need to find their dream job or start a business during transition. From May 15th to July 5th, drinkers at participating bars and restaurants will have a chance to thank military members, as well as support post-service professional opportunities. When a drinker purchases a Samuel Adams Boston Lager at a participating bar or restaurant, they can buy an additional for a current or former military member to enjoy. Drinkers who wish to Pour One Forward will be given a “thank you” postcard which will hang in the bar where it can later be exchanged for a Boston Lager (participating bar or restaurant will provide additional information). Additionally, for every #PourOneForward thank you post on social media, Samuel Adams will make a $1 donation to American Dream U*. Separately, for every 12 pack of Sam Adams sold at retail during the same time period, Sam Adams will donate $10 to American Dream U**. American Dream U is also pleased to announce that Jim Koch will be a featured speaker at this year’s VETRACON, on Friday June 3rd at Joint Base Myer-Henderson Hall, to offer business and career advice to over 600 active military, veterans and their families. Learn more about Pour One Forward on the Boston Blogger. *Donation up to $60,000. At participating bars and restaurants only from May 15th – July 5th. **Donation up to $60,000. At participating retailers only from May 15th – July 5th. POUR ONE FORWARD is a trademark of Vinternational Imports, Ltd. and is used with permission. American Dream U is a non-profit dedicated to helping our military get the education and access to resources they need to find their dream job or to start a business of their own. Since beginning American Dream U has always focused on the very important mission of career, business & professional development of our brothers in arms. Overall we are a team dedicated to bridging the gap between military and civilian life. We provide tools to active military, veterans and their spouses. The arsenal of tools we provide is always growing and it includes: national events, professional leadership and mentorship speeches, monthly meetups, an online educational program, a transition book that highlights veteran success stories, and a start-up accelerator program. To learn more, please visit http://americandreamu.org. Today, The Boston Beer Company brews more than 60 styles of beer. It relentlessly pursues the development of new styles and the perfection of classic beers by searching the world for the finest ingredients. Using the traditional four vessel brewing process, the Company often takes extra steps like dry-hopping, barrel-aging and a secondary fermentation known as krausening. The Company has also pioneered another revolution, the 'extreme beer' movement, where it seeks to challenge drinker's perceptions of what beer can be. The Boston Beer Company has been committed to elevating the image of American craft beer by entering festivals and competitions around the globe, and is one of world’s most awarded breweries at international beer competitions. As an independent company, brewing quality beer remains its primary focus. Although Samuel Adams beer is America's leading craft beer, it accounts for only one percent of the U.S. beer market. The Boston Beer Company will continue its independently-minded quest to brew great beer and to advocate for the growth of craft beer across America. For more information, please visit http://www.samueladams.com. 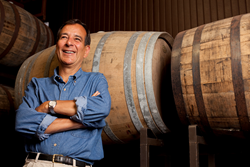 Samuel Adams is celebrating 32 years of brewing, and despite the craft brewery’s success, Jim Koch hasn’t forgotten how hard it is to start and run a successful small business. That’s why he created Samuel Adams Brewing the American Dream, a unique program that provides the two things he wishes he had when starting Samuel Adams: financing and real-world business advice. Launched in 2008 in partnership with Accion, the nation’s leading nonprofit provider of small business capital and coaching, Brewing the American Dream has coached more than 6,000 small business owners, provided more than $9.6 million in microloans to nearly 900 small businesses across the country. The program has also seen an unprecedented loan repayment rate of 98.1 percent – well above the national average for small business loans. To learn more about the program, please visit: http://btad.samueladams.com.